efficient use of the radio spectrum, in order to avoid harmful interference. Electromagnetic perturbation: electromagnetic phenomena that can degrade the equipment operation (such as, including, electromagnetic noise, unwanted emissions or an alteration of the propagation environment itself). Harmful interference: interference that, in any way, seriously and repeatedly alter, obstruct, or interrupt a radiocommunications service - that operates in compliance with the international, EU or national legal provisions – or jeopardizes / determines a substantial degrading of the functioning parameters of a radionavigation service or of other radiocommunications services, including life safety-related ones. The essential requirements are provided in the EU legislation, i.e. in the legislative package regarding product safety and conformity – the New Legislative Framework –, transposed in the national legislation by each EU Member State. Further details are available on ANCOM’s website here and here, for the directives under the New Legislative Framework corresponding to the communications domain. A key-indicator of a product’s (hence, an equipment’s) conformity with the EU legislation, an indicator which enables the free circulation of an equipment within the EU is the marking. An equipment commercialized on the EU market and used within the EU – in any of the EU Member States, including Romania – without an adequate marking is deemed as non-conforming by default. Why are DECT 6.0 fixed telephone terminals non-conforming? DECT 6.0 fixed telephone terminals purchased outside the EU are among the types of equipment the most frequently found to produce harmful interference. DECT is the abbreviation of Digital Enhanced Cordless Telecommunications. The DECT standard was initially developed in Europe, as a universal standard for short-distance wireless, for which the 1880-1900 MHz band was allocated. The standard DECT 6.0 is used only in USA, Canada and in some areas in Asia, where it is allocated a different frequency band, i.e. 1920-1930 MHz. Therefore, at present, anybody using such telephone models that are not conforming to the European DECT standard within the EU produces harmful interferences on other radiocommunications services that legally operate in the respective frequency band. Moreover, the most important harmful interferences are produced on the 3G frequency bands allocated at the European level, so the use of DECT 6.0 telephones is incompatible with the functioning of 3G mobile telephony services. In extreme cases, the interferences caused by these telephone terminals may affect calls to emergency services, including to 112, the fire brigade or the police. The most commonly used DECT 6.0 terminals, intended for use in USA and Canada, also used in Romania, where they generate harmful interference, are PANASONIC, VTECH, UNIDEN and AT&T. Sale and usage of DECT 6.0 terminals are forbidden in Romania! One of ANCOM’s major objectives is management of the radio spectrum on the territory of Romania, as well as in the Romanian airspace and territorial waters. In pursuit of this objective, ANCOM applies the policy and strategies for the long-term management of the radio spectrum elaborated by the Ministry of Communications and Information Society (MCSI). In Romania, the management of the radio spectrum is performed with due regard to the principles of objectivity, proportionality, transparency, equal treatment and, where possible, technological neutrality. The radio spectrum is a limited natural resource, which must be managed efficiently and rationally, in line with the requirement of satisfying the public, social and national defence interests and ensuring maximum benefits for the spectrum users, be they providers of electronic communications networks and/or services, private operators or end-users. When harmful interference affects the electronic communications services offered by the mobile providers, they complain to ANCOM. ANCOM’s experts, using equipment for measuring the frequency spectrum, track and identify the harmful interference source. Once the source device has been tracked, the user is informed on the non-conforming equipment and the corresponding legal provisions are enforced. In 2015, ANCOM settled numerous cases of harmful interference that affected the proper functioning of electronic communications services, especially of mobile telephony ones. 59 such interference cases were caused by the operation of 151 wireless fixed telephone terminals (DECT 6.0, without a marking). 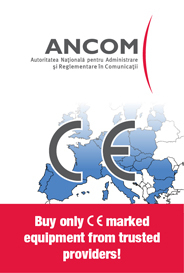 The information campaign conducted by ANCOM regarding the harmful interference caused by DECT 6.0 equipment is pursuant to the institution’s permanent concern for informing and educating the public on the equipment market in Romania.